B07CSPLLD8 New Aftermarket Replacement For Discontinued OEM Factory-Original Part Pictured. Fits Oster ExpressBake 2-Lb Horizontal Loaf Automatic Bread Maker Machine Model #'s 5838, 5838-33 & 5838-026 BUT ONLY IF YOUR MACHINE USES THE OLDER 3-RIVET BAKING PAN WITH THE ROUND DOCKING COLLAR (See Baking Pan Comparison Image). Bundle Includes Fresh Packet Of Active Dry Yeast. For Proprietary Concerns Items Received Will Differ From Images Displayed. We Are BBB-Accredited A+ Rated Breadmaker Part Store USA - Trusted Since 2002. B07CSPLLD8 New Aftermarket Replacement For Discontinued OEM Factory-Original Part Pictured. 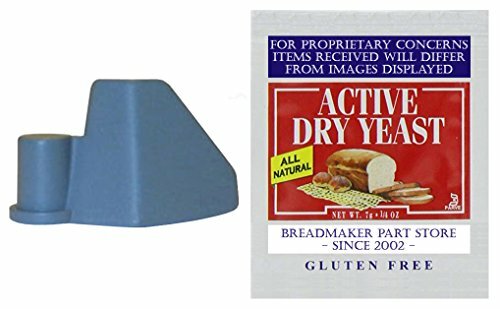 Fits Oster ExpressBake 2-Lb Horizontal Loaf Automatic Bread Maker Machine Model #'s 5838, 5838-33 & 5838-026 BUT ONLY IF YOUR MACHINE USES THE OLDER 3-RIVET BAKING PAN WITH THE ROUND DOCKING COLLAR (See Baking Pan Comparison Image). Bundle Includes Fresh Packet Of Active Dry Yeast. For Proprietary Concerns Items Received Will Differ From Images Displayed. We Are BBB-Accredited A+ Rated Breadmaker Part Store USA - Trusted Since 2002. Attachment Automatic Axe Axer Axing Bar Beat Beater Beating Bit Blend Blender Blending Device Hook Feather Hammer Hand Hook Impeller Implement Knead Kneed Kneeder Kneeding Making Mash Masher Mashing Mix Mixing Part Peice Piece Pound Pounder Pounding Prop Propeller Push Pusher Pushing Rake Raker Raking Replacement Rod Rotate Rotating Rotator Rotor Rotary Screw Shovel Shove Shover Shoving Spank Spanker Spanking Spatula Spare Spin Spinner Spinning Stir Stirrer Stirring Thingy Tool Wand Wing. Manufacturer: For Proprietary Concerns Items Received Will Differ From Images Displayed. Publisher: For Proprietary Concerns Items Received Will Differ From Images Displayed. Studio: For Proprietary Concerns Items Received Will Differ From Images Displayed.